The Q1 is built on Volkswagen's MQB platform sharing a 1.6 litre four-cylinder turbo-diesel and 1.4 litre petrol engine with the current A1. Audi's Quattro All-Wheel Drive will be standard. Audi has a distinct design language and styling shared with the Q3 and Q7. Similar in size to the Nissan Juke and Renault Captur, the Q1 will offer the premium feel that buyers have become to expect from the manufacturer. The new model also features a re-designed hexagonal grille design that appears on the refreshed Q7. The metallic frame now runs out towards the headlights, which will be similarly sharp, but will include LED running lights on all models. A shoulder line covers the length of the car, with broad wheel arches for a more muscular look, with large alloy wheels and a raised chassis height to complete the look. It is anticipated that the most likely option will be an adapted VW/Audi group's MQB platform with cabin space closer to the A3 and not the A1. It is anticipated that the 1.4-litre turbo petrol and 1.6-litre turbo diesel will be used. A four-wheel-drive system is also likely to be offered (one could expect a super-fast SQ1 model). Positioned slightly below the Q3, Audi's Q1 is expected to be the smallest premium crossover on the market. 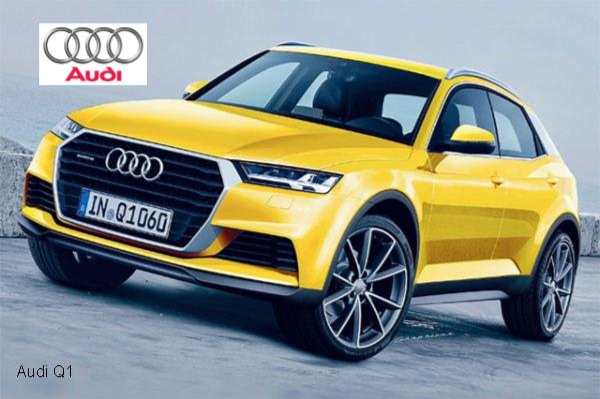 The image was released when Audi announced the Q1 would enter production. The Audi Q1 is designed to give Audi a lead in the fast-growing small-crossover segment: "It is part of a broad Q-model strategy," says CEO Rupert Stadler.